WND – Each Peach Pear Raspberry? The first week after Labor Day always makes me feel vaguely misanthropic. I wander around Boston thinking, ‘who are all you people, and why are you cluttering up what was my nice empty city?’ Double that sentiment for every time I have to avoid the hordes of students who have invaded. I’ll get over this in a week or so, but right now I’m still wishing it was summer and the city was empty and you could be guaranteed that nothing useful would happen after 11am on Friday. I’m missing summer for other reasons too, not the least of which is predictable weather. Boston is doing its usual schitzophrenic ungraceful fade into Fall. Tuesday was in the 90s and I slept with the fan on. Wednesday started rainy and blustery, cleared up to a lovely 80 degree afternoon and ended in the 50s and I slept under a quilt. Today is barely making it out of the 60s and making me wish I’d opted for a long sleeve sweater this morning. Getting dressed every morning is an exercise in hoping for the best and keeping a scarf at work. When I went up to Wilson Farms this weekend it was abundantly apparent that we’ve shifted into Fall. Last week there were tomatoes and corn as far as the eye could see. This week there were piles of pumpkins and acorn and butternut squash. Okay, there were also still flats of tomatoes and corn, and I can still find late nectarines and peaches. But, I can’t help but see prevalence of squash as an omen that the end is nigh. I’m attempting to greet this evidence of Fall with equanimity and poise, but mostly I’m failing. I resent every time the temperature dips below 80, even while I’m contemplating that I means I can make that Moroccan stuffed acorn squash recipe I’ve had bookmarked for months and possibly indulge in the butternut squash macaroni and cheese that sounds impossibly decadent. I never said I embraced consistency. What can I say, I need chicken stock. Of the many ways to eat corn, this is one of my favorites. I asked one of the chefs up at Wilson Farms whether there was some professional chef way of hulling corn that didn’t involve getting it all over everything. He shook his head sadly and said, “No, and can you imagine what our kitchen looks like when we hull 400-500 ears of corn in a day?” I couldn’t. My mother emailed me the other week to ask for recommendations on extending her menu because while she felt there was enough food to keep everyone happy, she was worried that the plate would look a little barren. I suggested melon. She replied that Europeans are nonplussed by melon served as an accompaniment to a meal (although wrapped with prosciutto, or hollowed out and filled with port it’s a perfectly acceptable appetizer). While I struggled to get over my horror at this statement, I sent her a list of other things she could serve. 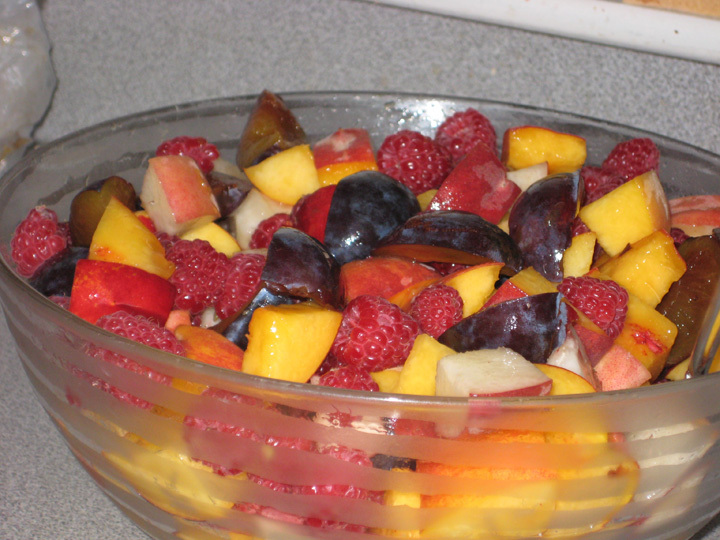 This was one of them and it sounded so appealing that I wanted to make it too. How much dressing you need/want is up to you. My mother made 1 head of broccoli’s worth of the recipe but used ¾ of the dressing. 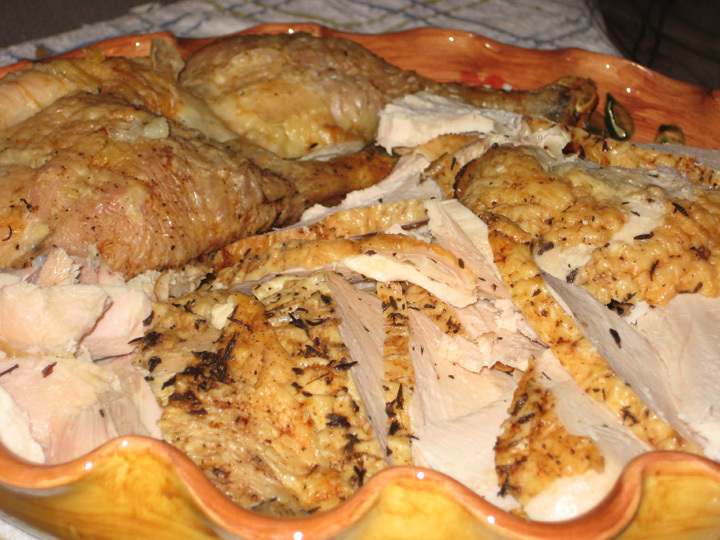 I made the full recipe and used probably slightly less than the full recipe for the dressing. So, how much you need will depend on how gooey you like your slaws. Trim broccoli and cut it into large chunks. From here, you can either feed it through your food processor’s slicing blade, use a mandoline to cut it into thin slices, or simply had chop it into smaller pieces. I’ll be honest, I just used a knife because I was worried my food processor would turn it into confetti and I couldn’t picture how you’d slice broccoli florets on a mandoline without also slicing your fingers to shreds. 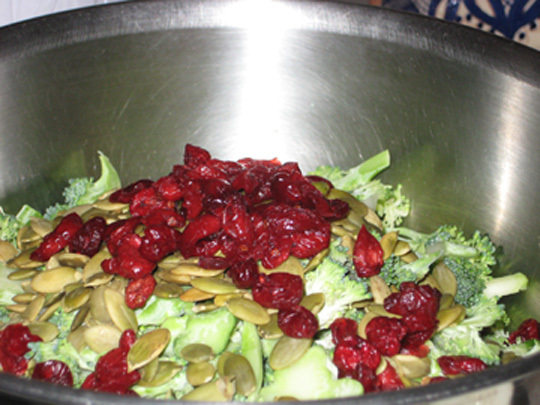 Toss the sliced broccoli with the almonds, cranberries and red onion in a large bowl. Meanwhile, whisk the dressing ingredients in a smaller one, with a good pinch of salt and black pepper. 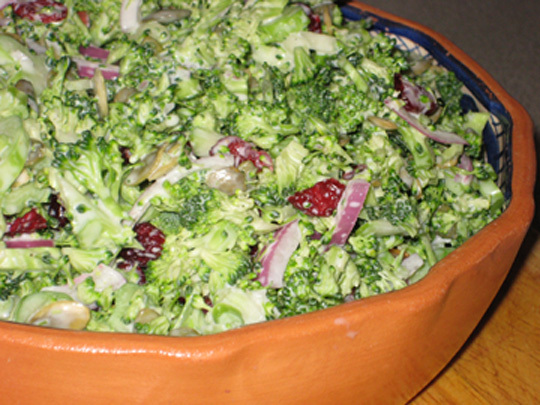 Pour the dressing over the broccoli and toss it well. * I used pepitas (shelled pumpkin seeds) because I usually need to make things nut free for Dinner nights and I wanted to see if it would work. It did. I think anything with a little crunch would work – walnuts, pecans, sunflower seeds, etc. ** Any dried fruit will work. I think the tartness of dried cranberries is nice, but pretty much anything would work – raisins, dried cherries, diced dried apricots, dried blueberries . . . . Okay, I’m confused. In the past couple of weeks I’ve seen several recipes for tomato salad. And, who needs a recipe for tomato salad? I’m not talking about fried green tomatoes on a bed of salad. Or a panzanella salad where you have to toast/fry the bread and then toss it with a vinaigrette. I’m not even talking about a caprese salad where not everyone might know that that just means tomatoes with some mozzarella and basil. 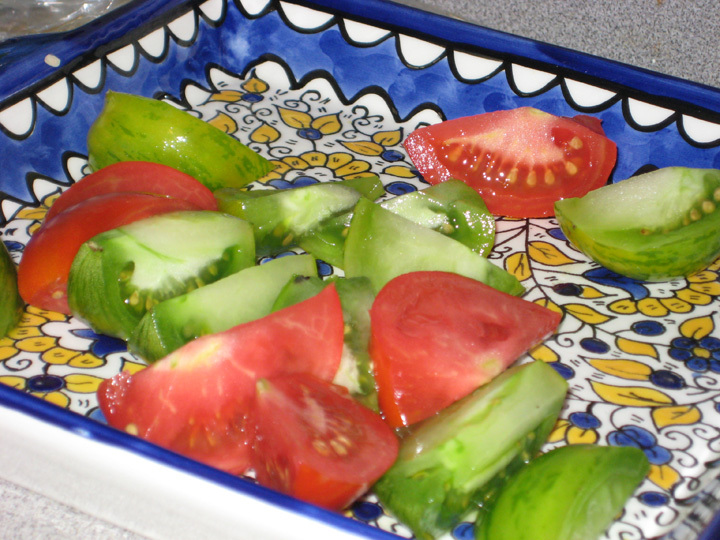 I’m talking about slice tomatoes, season with salt and pepper and serve. People need recipes for this? End of season fruit. I have to store up all of it before all I’m left with is squash, broccoli and brussel sprouts.